I recently activated a new Citi Card, and had a pretty decent experience with the customer service there. I thought they did a really good job, mainly because they didn’t ask me to repeat anything and two seconds after I said that I needed the card activated it was done, and I was able to get off the phone and move on with my live. Today, they sent me a survey about the experience, and I decided to fill it out, since I thought that the rep did an exceptional job. However, the survey software that they use seems to be designed to be frustrating and take way more time and thought than should be necessary. Further, I would be willing to bet money that this design is leading to a higher percentage of people like me, who get frustrated and give up a quarter of the way through. The following is a response to the second ‘comment’ section of a survey that they sent me. What is the primary reason for the score of 9 you just gave? Please be as specific as possible. This answer is not related to the question asked. 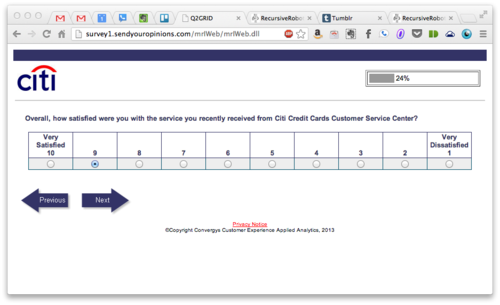 The design of this survey is so poorly designed that this is as far as I’m willing to go. For one thing, you’re asking me redundant information right now. How is this significantly different from whether or not I would recommend the service based on the customer service experience? Are you trying to waste my time by repeating questions to me, and asking me to write comments to you about them individually? Do you usually count from 1 to 10 backwards? Why don’t you give any visual queues besides text for the ratings? Are you not concerned about people getting confused and responding the opposite of what they intend to? Why are you taking up the entire horizontal space of my screen? I have a fairly large screen and actually need to turn my head to see all of this information. Don’t you guys make enough money to be able to afford to build better experiences for your customers? Are you concerned that a terrible experience with your survey software will have a negative impact on the answers given, or reflect poorly on your company? If your company’s survey looks like this, you’re doing it wrong.